 Apples to Apples game promotes vocabulary development.  Players also develop thinking skills.  Game received many awards including the Mensa Select prize. 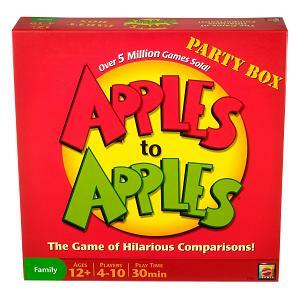 Apples to Apples received numerous awards including the National Parenting Center's seal of approval and the "Mensa Select" prize and the "Party Game of the Year" award. The Apples to Apples game can is a great family game that can be played by both adults and children and from 4 to 10 players. Game rules: In the game, each player is dealt seven "red apple" cards; on each is printed a noun or noun phrase. The judge lays down an adjective (or a "green apple" card) and places it on the table for everybody to see. Each player then scrambles to find a card that they think is the best match for the green apple card. The words make great sentence starters and they are also great for demonstrating the multiple meaning of words. The judge is actually encouraged to pick the match that is the most creative and humorous with is guaranteed to amuse children! The game also includes questions about famous people, places and events from history, literature or even politics. It also provides information on the cards for topics that may be challenging. Overall it is one of our recommended word board games that can help kids increase their vocabulary and literacy skills in no time. There are many versions available. The Party Box version is loaded with cards and has virtually unlimited gameplay and includes a beautiful woodburned box. The Junior Edition (ages 6 and up) includes simpler words. It encourages table talk and develops logical thought in younger players. Apples to Apples to Go (ages 7 and up) is the portable version of the game. It’s easy to carry and can be played by up to eight players. Perfect if you are traveling. Another advantage of the game is that it contains 100% new content which makes the investment even more worthwhile. There is also a Disney version which is called The Game of Goofy Comparisons (ages 12 and up). This version features Disney themes from Disney theme parks, movies and Disney Channel shows. The adjectives are simple enough for the kids to understand. It contains the Poison Apples card, available only in Disney versions. This version is perfect if you want to interest the younger family members. The Apples to Apples game is an excellent game that promotes vocabulary development. Children learn new words as they play and also acquire new knowledge. The game offers many opportunities to increase thinking skills and creativity.